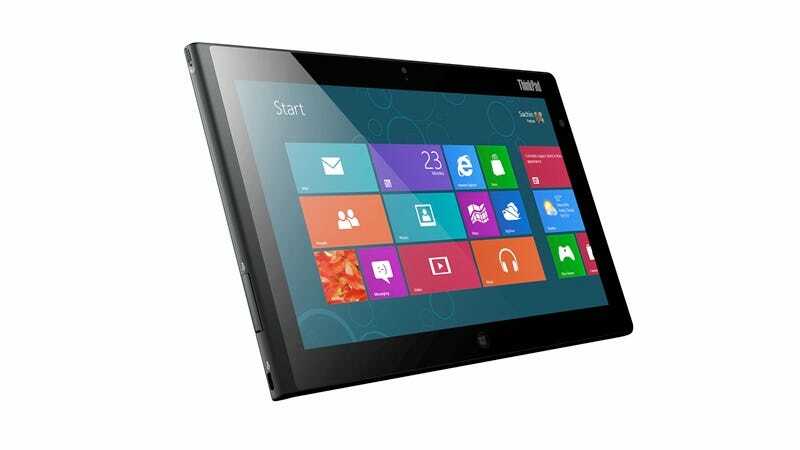 When Windows 8 launches in October, the Surface won't be the only tablet option. Joining it will be the 10.1-inch Lenovo ThinkPad Tablet 2, a Intel Atom-packing, enterprise-leaning device that might come packed with enough features to appeal to a larger swath of nerds. Slightly thicker than an iPad at 0.39 inches, but also lighter at 1.3 pounds, the ThinkPad Tablet 2 comes complete with an 1366x768 screen, 4G LTE internet, 8 megapixel front and 2 megapixel rear cams, full-size USB and HDMI ports, and the option for a digitizer and fingerprint reader. After spending a few minutes with a pre-release engineering sample, It's evident Lenovo is on the right track. There are still a few glitches with screen responsiveness that the company is working on, but overall, the tablet seemed snappy and responsive. As for the hardware itself, the build quality is solid, if not entirely having that premium feel thanks to the use of annoying port covers and a plastic shell that's not the world's most rigid. But the lightness and slimness of the tablet makes those annoyances more bearable (especially considering this is an enterprise device first). And since this is an enterprise device, you better believe this is a device that supports peripherals. There's a keyboard attachement with that signature nub for cursor control that really gives the Tablet 2 a laptop feel (if you're into that sort of thing). And of course, you can always hook up a keyboard or mouse via USB or Bluetooth.